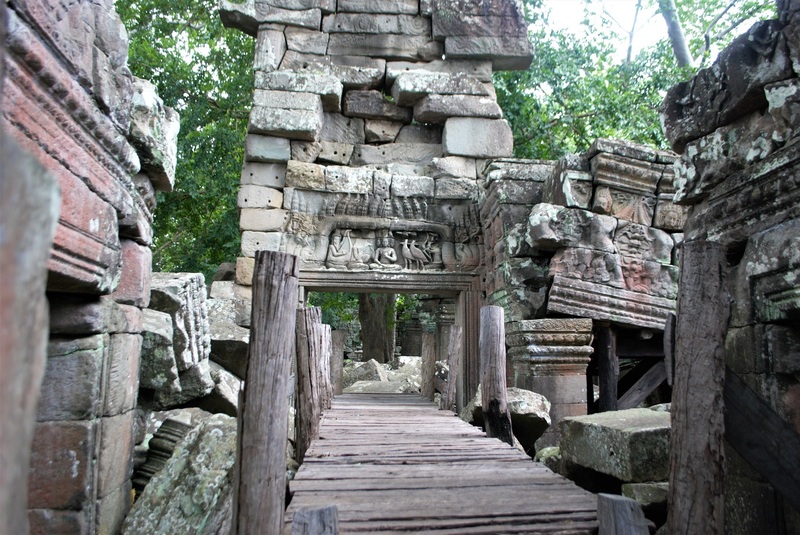 Nobody can say for sure why the Cambodian temple Banteay Chhmar was built in the first place. 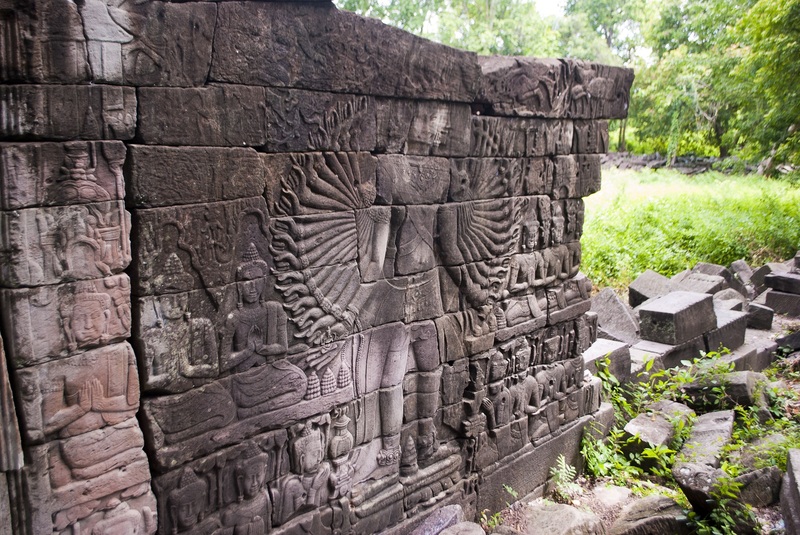 Was it a mausoleum for the Khmer King Jayavarman VII’s son Indravarman, killed in a battle with the Champa to the east? Was it a midpoint marker for a grand Khmer highway that stretched from Angkor Wat in the south to Prasat Hin Phimai in the north? The apsaras and bodhisattvas captured in mid-dance on Banteay Chhmar’s magnificent sandstone bas-reliefs, unfortunately, cannot tell us. What remains is tantalizing enough: the decaying ruins of a sprawling Khmer Empire temple built of sandstone and laterite, in size and detail being a very close rival to Angkor Wat about 70 miles southeast. 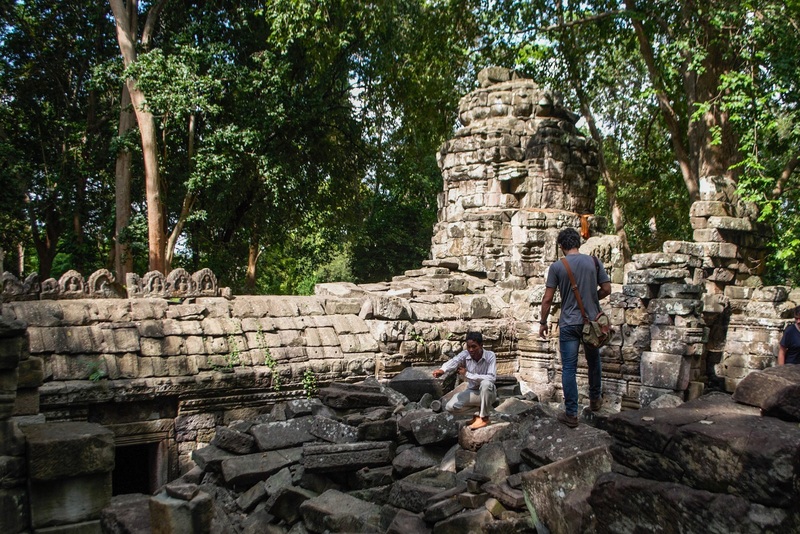 While the ravages of time have been less kind to Banteay Chhmar, a heroic restoration effort is slowly bringing its most picturesque parts back to the limelight. Much of the tour takes place on challenging terrain. You’ll walk over a jumble of blocks, not all of them firmly rooted to the ground; in the rainy season, the dirt paths circling the temple turn into muddy streams (assuming the road into the temple hasn’t been rendered impassable). Footwear with firmly-gripping soles and a precise sense of balance will be needed if you decide to take on this mysterious ruin in Cambodia’s far north. The start of the tour is easy enough: nothing more challenging than climbing up a short wooden staircase to a long sandstone wall carved with an epic bas-relief. 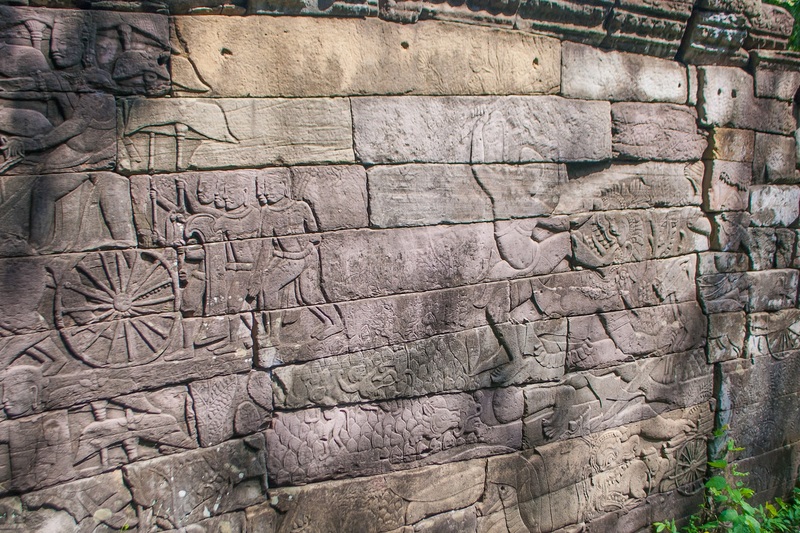 The wall art depicts the interminable wars between the Khmer Empire and the neighboring Champa; Jayavarman VII and Indravarman take center stage, their outsize figures dwarfing the Khmer and Champa soldiers marching in formation over a battlefield of sandstone. An account of the Khmer wars against the Champa unfolds in two dimensions on the eastern gallery wall. 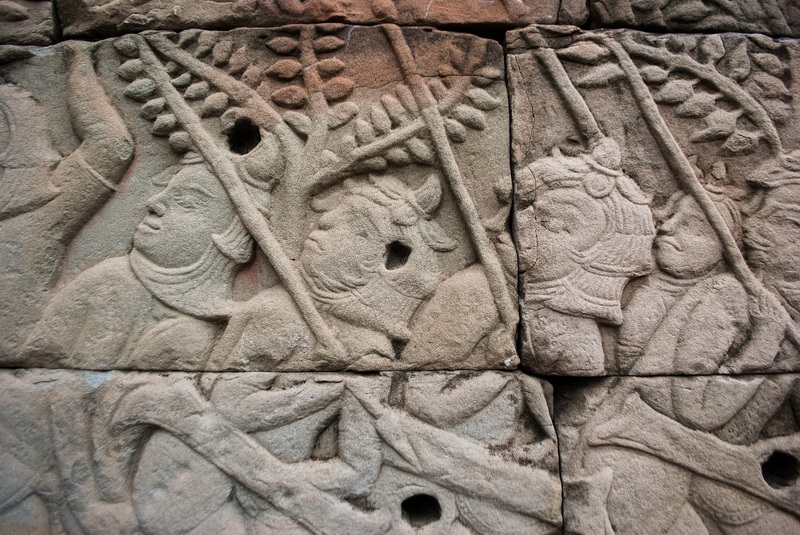 Overseen by the outsize Jayavarman VII and Indravarman in profile, formations of Khmer soldiers attack the Cham lines. The Khmer and Cham can be distinguished by their uniforms – the Khmer are bare-headed, while the Cham wear strange caps. As you move to the right, the Cham break formation and retreat – hordes of Cham can be seen fleeing in the opposite direction from the King, their heads turned backwards as if fearfully watching out for a Khmer advance (pictured above). Another panel features a naval battle between the Cham and Khmer, with a few unfortunate Cham falling overboard and being eaten by crocodiles. Exiting on the western temple wall, you’ll march right past one of Banteay Chhmar’s two surviving depictions of Avalokitesvara, the bodhisattva revered for his compassion. In Buddhist lore, Amitabha Buddha took pity on Avalokitesvara and gave him eleven heads and a thousand arms with which to hear the cries of the unredeemed and to help them in their need. The two remaining Avalokitesvara in Banteay Chhmar are depicted with 32 arms and 22 arms respectively. A gaping hole in the wall next to one of these depictions (see above) reminds the visitor of the massive looting that is partly responsible for the temple’s state of ruin. 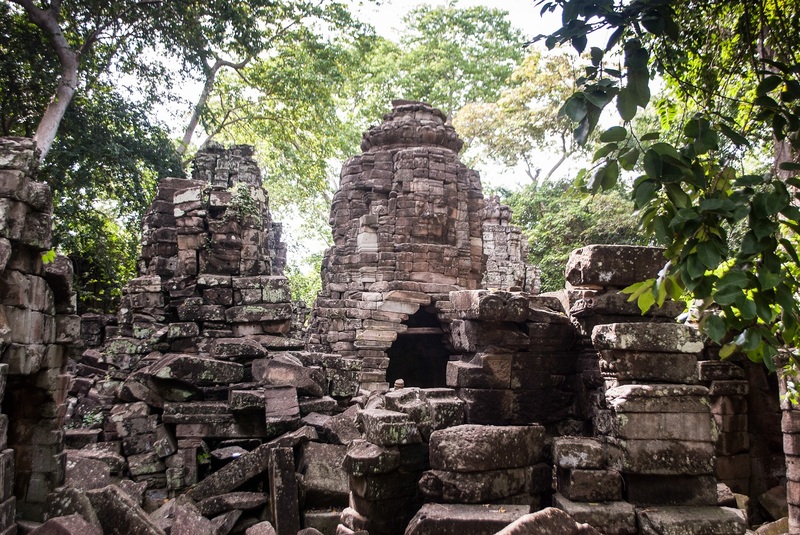 In 1998, suspected members of the Cambodian Army roped off Banteay Chhmar and set to work on the temple with jackhammers, carting off sections of the southwestern wall. 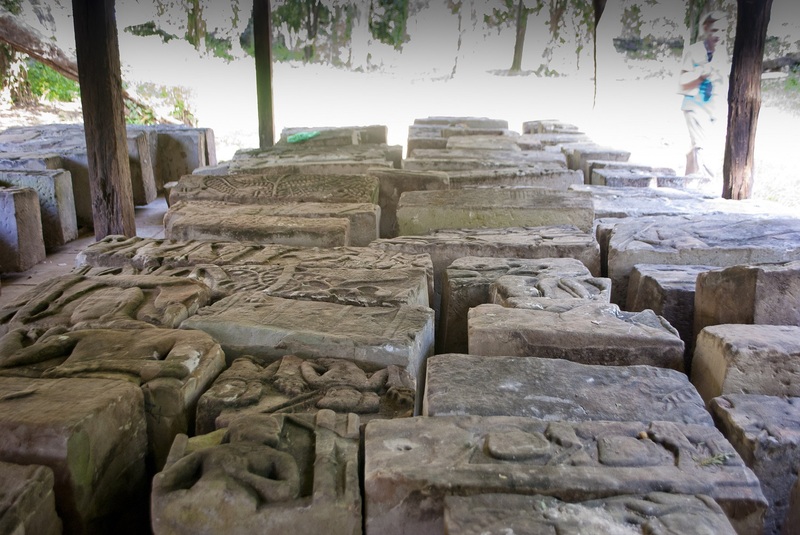 One truckload of the loot was intercepted near the Thai border; this recovered section, featuring two Avalokitesvara reliefs, is now safely on display in Phnom Penh’s National Museum. Another section with two more reliefs was never found again. Parts of the artwork blend history with fantasy, particularly in a section of the western wall that depicts Indravarman doing battle with the monster Rahu, bringer of eclipses in Hindu mythology. The fantasy scene may be an allegorical depiction of Indravarman’s successful battle with a usurper. The monster appears twice, as seen above – one depiction shows him in battle with Indravarman, while another depiction immediately below shows the monster devouring a beast of burden attached to a cart. A passageway through tumbled walls in the northwest of the Banteay Chhmar enclosure leads you past a warehouse where as-yet unused sandstone blocks lie ready to be placed. The warehouse is a reminder that Banteay Chhmar, unlike Angkor Wat, is a work very much in progress. The U.S.-based NGO Global Heritage Fund set to work on Banteay Chhmar in 2008, hiring outside experts to map out a massive restoration effort. 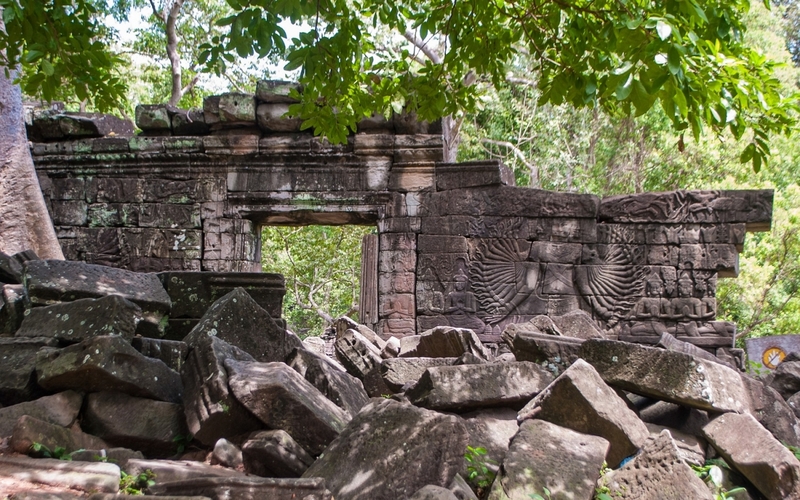 GHF archaeologists and their Khmer counterparts managed to stop looting, reconstruct large sections of the temple, and coordinate with surrounding towns to implement a community-based tourism program. Some of the damage to Banteay Chhmar was self inflicted, attributable to poor design decisions. Archaeologists believe that the temple was built on a shorter timetable than Angkor Wat; as a result, less care was given to choosing and shaping the sandstone blocks (the blocks are, on average, smaller – making the sum of their parts less stable over time). The foundation, too, was problematic – changes in the water table shifted the walls out of place, and brought them down in the long run. The enigmatic Tower 18 is the only “face tower” in Banteay Chhmar retaining all four faces looking out to the cardinal points. Yet it, too, was in danger of collapse before GHF stepped in; heavy monsoon rains in 2009 had dangerously destabilized the tower. The heroic restoration effort that followed involved dismantling the structure, 3D-scanning each block, and reassembling the lot in virtual reality before repeating the process in real life. The tower stands in the midst of a courtyard littered with large sandstone blocks at odd angles – making your way through the courtyard requires all the balance and reflexes of a mountain goat. Some of the blocks – thankfully few – are loose, and may tip over if you step on them wrong. After marveling at the tower’s mysteriously benevolent faces, it’s time to make your way northward over tumbled sandstone blocks until you exit through the north wall. The passageway betrays a few signs of recent interference – a wooden gangway now stretches over the last few yards to the wall, and a wooden scaffold supports a dangerous-looking pile of sandstone overhanging the exit. 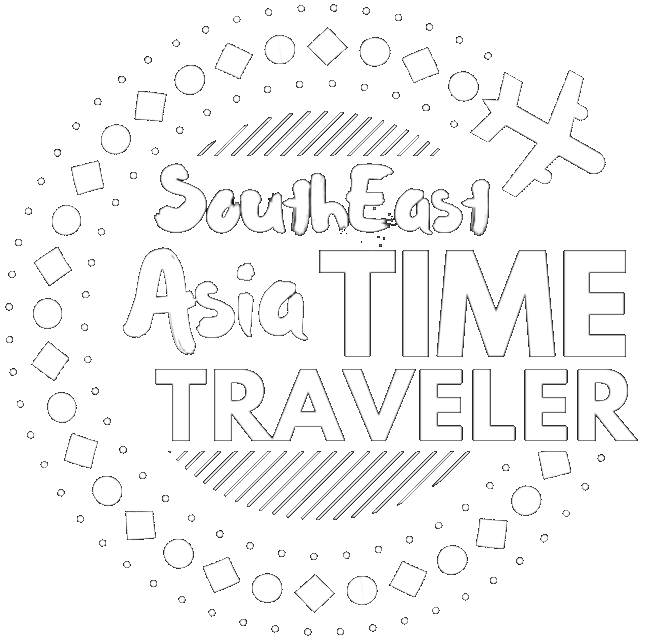 From this point, visitors can take their hired rides out to explore several other temples in the vicinity, among them another face tower known as “Ta Prohm”, and a more distant temple ruin called “Banteay Torp”, built for Jayavarman VII’s soldiers. More on those other places to visit here: Five Stops around Banteay Chhmar, Cambodia.